Seasonal or discontinued products sitting in inventory limit cash flow and may make it more difficult for merchants to invest in newer, faster-selling or higher-margin products. While many retailers discount or close out these products, there may be an opportunity to maintain higher margins by selling across borders. Leftover seasonal items and other old inventory can be a significant problem for some retailers. The situation is common. A buyer orders an array of cute fall tops or jackets. Many of the sizes sell out, but now it is almost summer, American consumers are thinking about shorts and sandals not long-sleeve blouses or jackets, and the remaining inventory for these items will have to sit for almost a year unless something is done. Frequently, retailers deeply discount excess inventory to free up cash or warehouse space even if that means selling some items at or below their original cost. Consider, as an example, the clearance section on Target’s website that featured discounts of up to 85 percent at the time of writing. 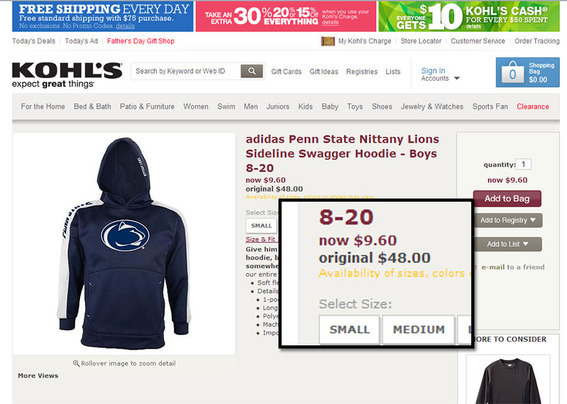 Similarly, Kohl’s recently had a $48.00 hoodie on clearance on its site for $9.60. Kohl’s offers a hoodie at 80 percent off as a seasonal closeout. This week, Phoenix, Ariz. is expected to experience highs in the 90’s. But other nations, particularly in the Southern hemisphere, at extreme latitudes, or at much higher elevations will have mild, if not cold, temperatures. When it is summer in the U.S. it is winter south of the equator. Shoppers in these nations may be willing to pay full price for items like the hoodie Kohl’s is offering for some 80 percent off here in the U.S. In fact, in some rare cases, American products can actually carry a premium in other nations. Sellers in the U.S. may be able to take advantage of this demand, selling seasonal products to nations with different climates at a profit rather than discounting those products and selling at or below cost as closeouts. In spite of the opportunity to move clearance items, there are certainly still challenges associated with selling across international borders, including localization — i.e., currency, language, payment methods — or even marketing in Australia or South Africa. One way to address the site and marketing obstacles may be to sell on marketplaces like Amazon. It has many national and regional sites — as an example check out Amazon Brazil. With relative ease, businesses in the U.S. can post products on both Amazon’s U.S. page and its Brazil or Australia sites. In fact, there are even some third-party tools available to help with the process. Once a merchant has had some success with selling would-be clearance items internationally, a next step may be to hire a fulfillment company in the target region or one that is accustomed to global shipping. To further the Amazon example, a seller could move closeout items to a Fulfillment by Amazon warehouse, post the items on Amazon’s global sites or its own international site, and let Amazon manage the entire shipping process. To be sure, there would be additional fees associated with order fulfillment, but often these fees will be less damaging to margins than offering 80 percent off to sell clearance items, like Kohl’s hoodie, domestically.